Be the first to share your favorite memory, photo or story of Myredia. This memorial page is dedicated for family, friends and future generations to celebrate the life of their loved one. 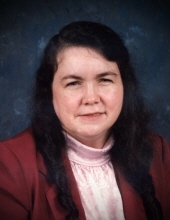 Myredia Howell age 68 of Teaberry wife of Edgar Howell passed away from this life on Wednesday March 27th, 2019 at McDowell ARH. Myredia was born on March 11th, 1951 in Pikeville, Kentucky a daughter to the late Kendrick Johnson and Lakie Hamilton Johnson. She was a former owner and operator of Howells Grocery Store and a member of Zion Old Regular Baptist Church. Along with her husband she is survived by her son: Brian Keith Howell and his wife Alisa; three grandsons: Brian Tyler Howell of Richmond, Cameron Keith Howell and Gabriel Edward Howell both of Grethel; two brothers: Jimmy Darrell Johnson and Billy Joe Johnson both of Teaberry; and two sisters: Rachel Ann Coleman of Pikeville and Emma Sue Rogers of Harold. Along with a host of Nieces and Nephews. She is preceded in death along with her parents by her siblings: Carl Douglas Johnson, Jerry Ray Johnson, Roy Gene Johnson and Judy Carol Hamilton. "Email Address" would like to share the life celebration of Myredia Howell. Click on the "link" to go to share a favorite memory or leave a condolence message for the family.